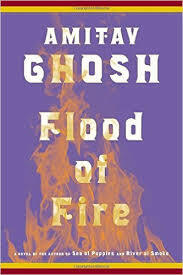 I loved Ghosh’s first books in this trilogy – Sea of Poppies (2008) and River of Smoke (2011) and yes, it is necessary to read the books in order to follow what is happening to the characters and thire world. The setting is in Eastern India (the River Ganges and Calcutta) over the sea to Mauritania and eventually Canton, China. Shiploads of potential Indian servants are transported from India to Mauritius, a British island in the South Indian Ocean. With them are westerners going to take care of the opium trade and a biologist and a few others. River of Smoke takes place in Canton for the most part, and deals with the opium trade and traders – very exciting. See http://qz.com/411578/amitav-ghoshs-ibis-trilogy-the-story-so-far/ to review the story in the first two books. The narrative speeds along mostly alternating between these four characters and for the most part in 3rd person except for Neel who writes a diary. I think I enjoyed Shireen’s story the most although they all came together – Shireen came to life. I had mixed feelings about Zachary Reid this time although his early situations with Mrs. Burnham were hilarious. The trilogy overall is better than the individual books but the first two are better than the third but overall Flood of Fire is a fine ending to the trilogy. I’ll be glad to read more of Amitov’s works.